This slot from IGT is aimed to all of you that love the old classic role play of Dungeons & Dragons. Perhaps you played it with your friends as a kid. The slot machine Dungeons & Dragons has 5 reels and 20 pay lines for you to bet on. As soon as you start to play this slot machine you will get a feeling of nostalgia. The symbols in this slot resemble the original Dungeons & Dragons lay out and you will be thrown back into the fantasy land of adventure and danger. Dungeons & Dragons Crystal Caverns present a reel adventure with huge, dazzling caverns containing glittering gems and jewels beyond compare. You have to make your way through hordes of trolls, ogres and skeletons and reap the rewards of incredible treasure. Dungeons & Dragons Crystal Caverns has the Tumbling Reels feature which means that the reels are not spinning, they are tumbling from above. Winning symbol combinations disappear and new symbols tumble down to replace the vanished symbols. You can win again and again and again on the same play of the reels! 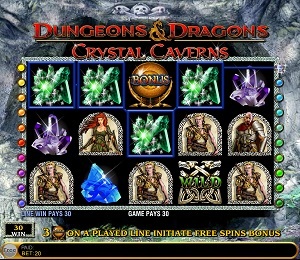 Dungeons & Dragons Crystal Caverns is a nicely created slot machine from IGT. The graphics are outstanding in detail and form. The symbols are very suitable for the theme in this slot machine. The sound is as suitable as the look; once you hit a winning combination on the reels a dramatic music score will be played. Once you enter the free spin feature, the sound effects are very exciting, very similar to the blockbuster adventure movies. The overall conclusion is that ITG presents a great slot machine where the graphics and sounds are adding a great level of excitement to the game. The symbols used in this slot machine are all themed related. The lower paying symbols are gems in different colours. You will also see characters like an elf, some type of hero and a knight character. The Wild symbol has the wording of wild on it. This symbol will substitute for all other symbols in any winning line except for the scatter bonus symbols. There are 3 scatter symbols which pays multiplied by total bet; the troll, ogre and skeleton. The bonus symbol will trigger the free spin feature. You trigger the Tumbling Treasures Bonus by getting 3 Bonus symbols on a payline. Once you have triggered the bonus feature, you receive 6 free spins. During the Tumbling Treasures Bonus, you can retrigger the Bonus multiple times. Your Tumbling Treasures Bonus continues until you run out of free spins or until you have played 300 free spins. To retrigger the Bonus, you need to get 3, 4 or 5 Bonus symbols anywhere on the Bonus reels. If you get 3 Bonus symbols, you have an equal chance to win an additional 2, 3 or 4 free spins. If you get 4 Bonus symbols, you have an equal chance to win an additional 4, 6, 8 or 10 free spins. If you get 5 Bonus symbols, you have an equal chance to win an additional 6, 8, 10, 12 or 15 free spins. Dungeons & Dragons Crystal Caverns has 20 pay lines for you to bet on. You can bet between 1 and 5 casino credit per pay line. This slot does not have an auto play functions. « More slotmachines guides Article last updated: Tuesday, August 28, 2012.